Whether your garage door works smoothly and easily, or shakes and squeaks its way along the tracks, is largely down to how well the opener works. If the drive system is suffering from the outcome of all the wear and tear it sustained, or if the opener has developed an internal malfunction, the result will almost always cause the entire door to become difficult to use. Here are a few key warning signs that you should be aware of. A worn out motor gear can’t produce the same amount of horsepower as it used to. It will still try, though, which usually means your door will move very slowly and stutteringly, or may stop along the way. This can be incredibly annoying, and can inconvenience you in the worst possible time, especially if the gear breaks completely. Motor repairs will be required, and the damaged gear will probably need to be replaced. Your opener uses safety features to prevent it from closing when there’s something in the door's way. Sometimes, the circuitry that controls these features can develop a glitch, causing the door to stop or reverse its direction even though there’s nothing there. Check that there’s nothing in the door’s way, and that the safety sensors aren’t obstructed or misaligned - if they aren't, and there are no blockages in the tracks that are keeping the rollers from moving past them, then your opener might be malfunctioning and its circuit board will need to be examined. 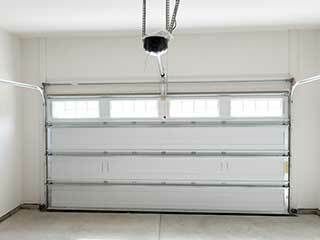 Garage door openers are designed to work quietly, especially modern units. Even the chain drive models that are made today are far less noisy than their predecessors. If your door starts making a lot of noise, then something may have gone wrong. There can be many root causes of this problem, such as worn out gears or a damaged drive system. You should lubricate all the moving metal parts, including the door hinges and the springs. If the noise persists, have one of our experts take a look. If your opener is showing any of these signs, or other ones, the best thing to do is have our technicians check it out. Our team at Garage Door Repair Eden Prairie is familiar with all of the industry's leading brands, so we’ll be able to quickly find what the issue is and to fix it.